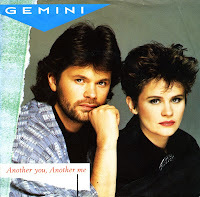 Written by Benny Andersson and Björn Ulvaeus, 'Another you, another me' was the second single taken from Gemini's self-titled debut album. Compared to 'Just like that', this was the weaker track. The single didn't reach the chart in as many countries, either. The B-side of this single is the album track 'Falling', although in Scandinavia the B-side was another album track 'Slowly'. 'Just like that' was written and composed by Abba members Bjorn Ulvaeus and Benny Andersson in 1982. The song was one of many to be recorded for Abba's new studio album. After several attempts at recording it, the band finally decided to put it aside (A part of it was finally released in 1994 when Abba released the 'Thank you for the music' box set). 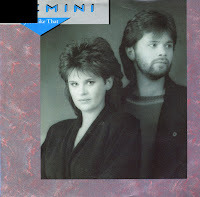 In 1985, Ulvaeus and Andersson decided to rework both composition and lyrics, offering it to Karin and Anders Glenmark, who recorded an album as Gemini, produced by the two Abba members. The single reached number 21 in the Netherlands, making it their only hit single in this country to date. 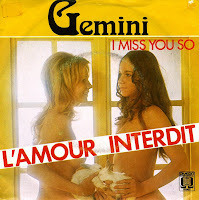 Besides the Swedish group Gemini, there is also a Belgian one. A quite different one, too. It is obvious from this sleeve, but when you listen to the music, you notice another difference: this is not serious pop music, but a track styled after other novelty records like 'Je t'aime... moi non plus' by Jane Birkin and Serge Gainsbourg. In other words: lots of groaning and moaning. Gemini consists of Karin and Anders Glenmark. They debuted in 1985 with a self-titled album, which included their only international hit, 'Just like that'. 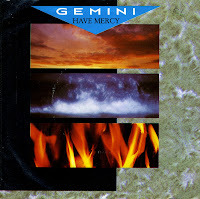 'Have mercy' was the follow-up single in Europe, but it flopped. Just like all the other songs on their debut album, 'Have mercy' was written by Benny Andersson and Bjorn Ulvaeus, from Abba. Which just goes to show that even that didn't guarantee success in the eighties.